Gardening is a special activity which is both relaxing and makes you feel like you are at peace. It doesn’t matter whether you are a gardener with your own garden or just a small piece of gardening paradise in your backyard, you know that using your hands to create something that special is a feeling that fills your entire body. Sharing that feeling with someone you love is even better and due to that, I want to share with you ideas you can do. Share your garden with your kids and show them the beauty of gardening. Kids will be kids, which mean that sometimes they won’t realize that they are playing where they don’t suppose. 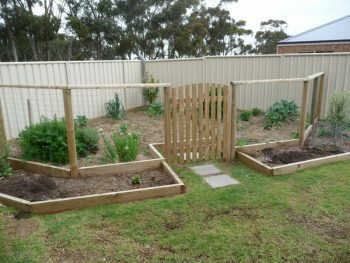 Due to that, It is definitely suggested that you divide the backyard from your garden landscape with a little fence. 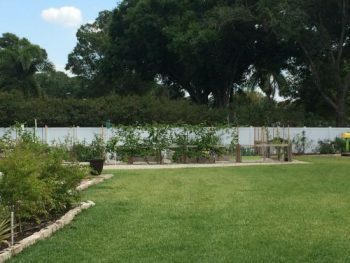 It doesn’t have to be a big fence because your kids can enter the garden, but it is more like a reminder for them that on the other side of the fence are vegetables. If you have a small child or a toddler, it is always a good idea to keep them close to home. Having a big backyard is a dream, but having a small child in a big backyard can be dangerous. Due to that, organize your toddler a safe-to-be area where he can play, watch the birds and just enjoy. It can be a small grass patch you can fill with his favorite toys or it can be a sandbox you made for him. It is entirely up to you to organize that corner the way you like it, as long as it is safe for your beloved child. Having a shed for your gardening tools is a must, especially when you have kids. Kids are curious and they love to explore different areas, especially tools they see you are using. Due to that, keep your gardening tools safe and away from them because they can hurt themselves. If you want, you can get your kids toys which look like your gardening tools. That way, your kid will do what you are doing but with toys which are far more kid-friendly than real gardening tools. If you have strong trees in your backyard, attach a tire to the biggest branch and let your kids enjoy their new swing. That is not something we can see that often today and it is a shame. When we were young, having a tire-swing was a must for every home and with this toy, you can share the memories of your childhood with your kids. Mark is a foosball player and a blogger who made the best hobby in the world by combining his two passions – blogging and foosball. His best hobby in the world is called the Foosball Zone and he loves to share his experience with his loyal readers. If you want to be a part of his blog, you can read about it here.